Written for Interactions magazine by Youngho Rhee and Juyoun Lee. This article proposes several models of community, including a model of “mobile community”—an extension of physical community merged with online community. The authors also provide examples of how these models have contributed to the development of community applications in their work at Samsung. For the past decade, mobile phones have been used primarily to make phone calls. However, with an increase in the number of mobile phone users and improvements to mobile phone technology, new forms of interaction and new kinds of applications become possible. Now the role of mobile phones is expanding to support forming and maintaining “community”—both geographic based communities and communities based on diverse cultural interests—creating new ways for people to connect and communicate. The rise of online communities is one of the most exciting commercial and social opportunities of this decade. Today anyone working in the converging worlds of communications, media, and technology knows that communities are perhaps the most influential factor and value-added service in the emerging market, potentially exceeding games, voting or polling applications, or music and video downloads because of their long-term sustainability. In fact, a public report estimates that the market value of community will be around €673 billion by 2010 . Traditionally, the term “community” defined a group of people living in a common location . But as the Internet reduced the limitations of distance, “community” has expanded to include groups organized around common values and common interests. Early Internet community applications limited online interaction for members—the community was active only when members were in front of a personal computer. In contrast, mobile phones support interaction virtually anywhere, but until recently mobile phones did a poor job of supporting community. A new generation of mobile phone applications is beginning to support not just one-to-one communications, but also one-to-many, many-to-one, and many-to-many communications—an essential part of creating, reinforcing, and managing a community (see Figure 1). Figure 1. Mobile communication has focused on one-to-one connections for many years; however, the role will expand to group communication, which is needed for efficient and effective community management. and the history of each. These contextual elements (location, task, domain, contacts, and history) may combine to “trigger” realization of both individual and group goals. Some goals and activities will already be “in play”, while others will emerge from interaction. Browsing a library shelf may lead to the discovery of a new book. Stepping into a cafe may involve running into a friend. Mobile community applications become especially valuable when they support serendipity—spontaneous or unplanned events—and aid the formation of ad hoc communities or “flash groups” (which may dissolve after the event). This last feature is a main difference between mobile communities and communities in the online and physical worlds. A mobile community, therefore, can be defined as a group of people with shared interests (i.e., health, safety, entertainment, and so on) getting together first online and then in person to define common goals, agree on actions to achieve them, and then carry out their plans. A mobile community can be built up in private (consisting of friends, family, or colleagues—people who are well known to each other) or created in public (a flash group assembled because of shared interests and coincidences of space and time). Broadly, the mobile community model encompasses two varieties: those centered on relationships and those centered on tasks. The former are typically informal, grassroots-oriented communities that revolve around shared interests, ideas, topics, and goals. In these communities, the development of relationships is the primary goal. In contrast, task-centered communities tend to be more structured and impersonal. The relationships established or augmented online are a means to a mutual end, such as efficiently making a satisfying purchase. and between individuals and groups devoted to particular topics. 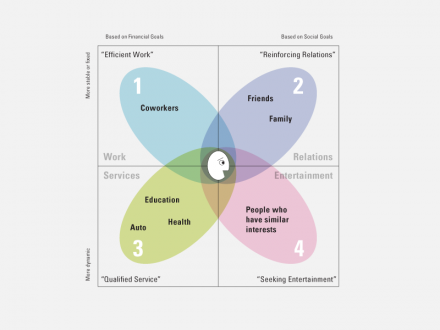 Based on two continuums—for profit versus nonprofit (or financial capital versus social capital) and strong personal ties versus looser social connections—the model articulates four types of communities (see Figure 2). Any individual might be a member of all four types of communities; this case is visualized by the face in the center of Figure 2. Figure 2. Mobile communities lie within a space defined by two dimensions: focus of community goals and community longevity or stability. Mobile communities in the first column (1 and 3) focus on financial goals (more explicit transactions), while those in the second column (2 and 4) focus on social goals (softer, less tangible exchanges). Mobile communities in the first row (1 and 2) are longer-lived and change slowly, while those in the second row (3 and 4) are shorter-lived and more ad hoc. 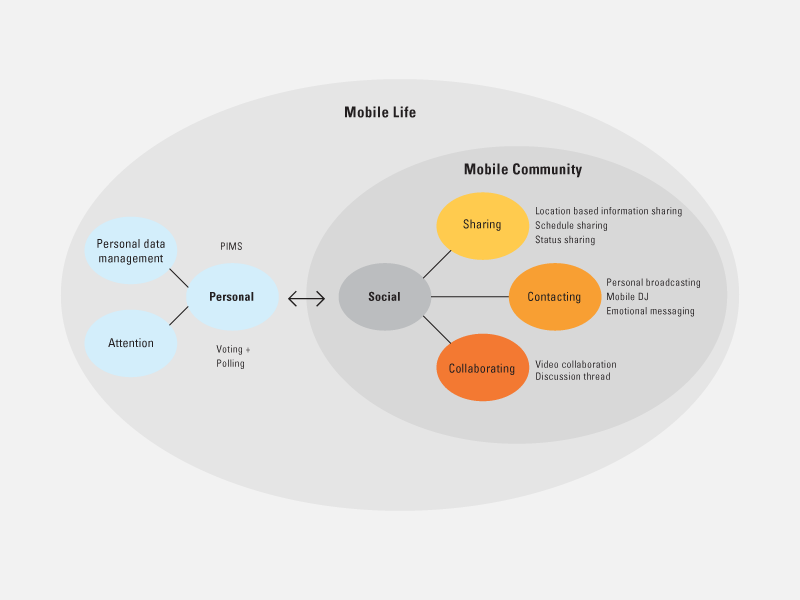 Most people are members of all four types of mobile communities. Groups of people in the left-hand column (the first and third quadrants) are likely to value “efficiency” more than groups in the right-hand column (the second and fourth quadrants). On the other hand, groups in the right-hand column are organized around social goals, not profits or business interests. For example, moral obligations or personal connections can motivate and sustain community. Almost by definition, communities require high levels of interaction between members to remain viable. Members of a family interact with each other according to defined social roles. We expect that groups based on common interests will also develop shared social norms for interaction. Groups in the top row (the first and second quadrant) are more stable or fixed by nature than groups in the bottom row (the third and fourth quadrants). The goal of friend and family groups existing in the top row, for instance, is to maintain relationships and reinforce the tribe through active participation. Those goals often lead members to share memorable events. Likewise, members of a work group make efforts to reinforce team spirit and build relationships in support of shared goals, such as project milestones, market share, or net income. On the other hand, the group-formation process in the bottom row is relatively dynamic and temporary. An auto service (in the third quadrant) can improve its service by adding individual personalization. One who has an accident, for example, requires a speedy and systematic interactive service of a community, composed of hospital, police and emergency services, and insurance company. The systematic service and interactivity supported by these parties forms a temporary community around the “event” (the accident) and the specific time and place where it happens. The need for rich and affordable communication increases as a community grows and matures. This circumstance suggests we may be able to develop rules or heuristics regarding communication within community services. Of course, flexible and easy-to-use user interfaces for sharing media and collaborating on projects are prerequisites for creating successful new mobile experiences. New opportunities for mobile community require rich, affordable, and effortless digital interaction for sharing, contacting, collaborating and being entertained. 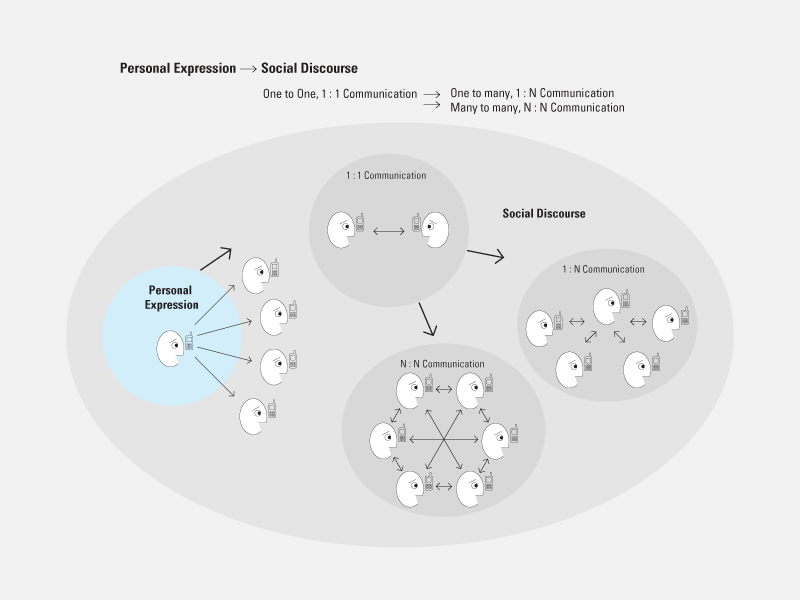 Communication within a community is not limited to the explicit dialogue between members; rather it must also expand to include delivery of tacit knowledge in a broad sense, including sharing events, emotions, and experiences across time and place, which bring closer relationships and increased trust. We call this range of exchanges rich social communication. For example, sharing views on a wide range of issues with some or all members of the group may be more important to building and maintaining community than optimizing direct communication, such as SMS or calling. That may be because exchanging members’ intentions or views encourages creating tacit knowledge that leads to more and deeper interactions among community members. Likewise, a single video file of combined clips created by siblings becomes another form of tacit knowledge, standing for family love and encouraging interaction between family members. Sharing one’s status or schedule with other community members implies that one wants to meet or keep in touch. Broadcasting personal music or video (whether to friends or to people unknown) presents a virtual identity and may lead to forming a flash tribe around a favorite song, band, or genre. All these functions can be summarized by three key features—sharing, contacting, and collaborating (see Figure 3). Figure 3. Key features of mobile community applications include sharing, contacting, and collaborating—all of which support socializing. In addition, other functions (for example, personal information management and voting as personalization) are added to deal with information generated in a community. When designing a UI to support rich social communication, there can be a deliberate process for fashioning features, such as sharing, contacting, and collaborating . This process is started by writing a sentence that describes a social behavior pattern. Sharing, for example, is characterized as a subject-verb-object construct. (Families share photos, or fans share music.) Similarly, constructs are made for other relevant social behavior patterns. (Friends exchange information about their whereabouts, or members create new videos.) 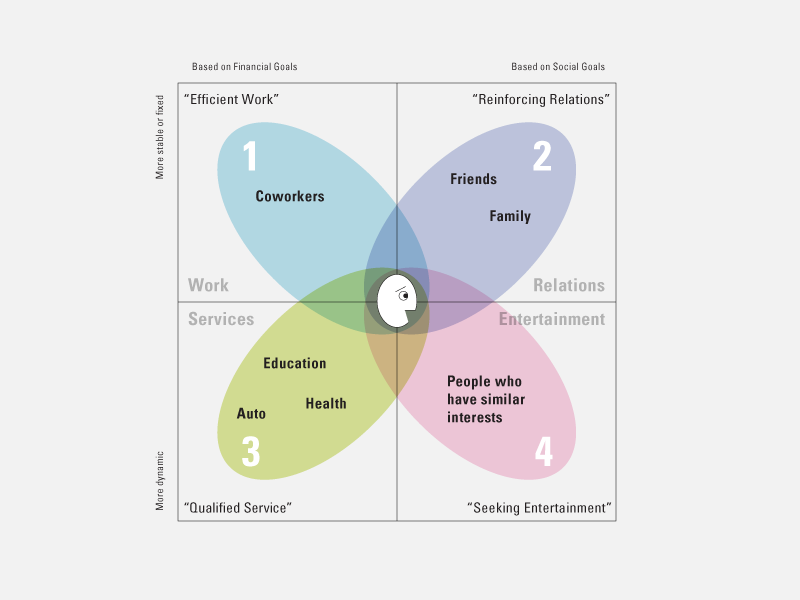 To conclude, three core components (people, goal, and content—or actor, action, and objective) are wedded coherently together in order to visualize three key features of socializing (see Figure 4). Figure 4. UI components are created by composing sentences that suggest ways to organize community features. 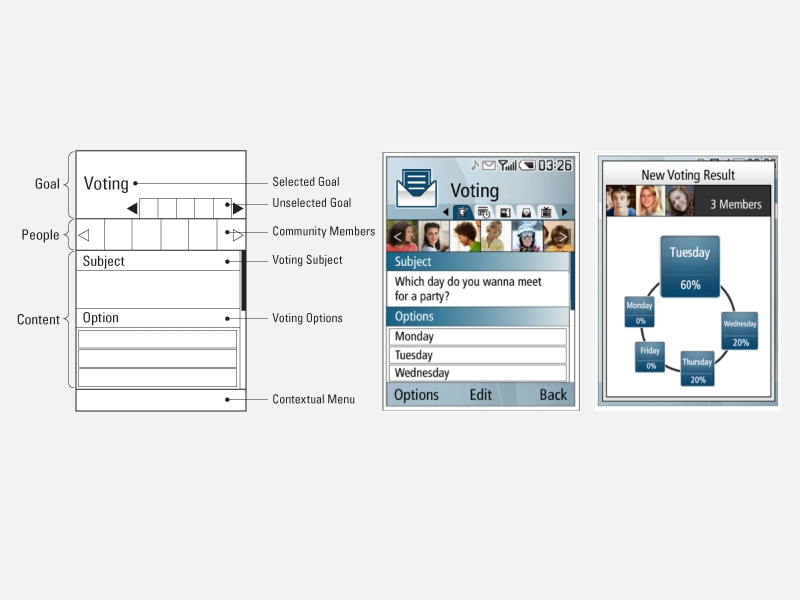 With these three constructs, UI for mobile community is conceptualized (see Figure 5). The top row sets up a community’s common goal. 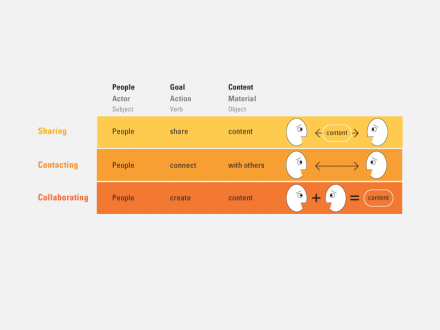 Sharing, contacting, and collaborating with people in the group who have something in common is automatically located in a second row, along with user actions dealing with the goal (features). Figure 5. Collective (e.g., friends or family) decisions are visually presented and delivered to the members within a voting or polling application. Finally, content such as various multimedia objects and text are attached at the bottom. Additional features necessary for community activity, such as schedule sharing and personal broadcasting, can be customized for various mobile devices. For example, an SMS thread in Figure 6 entitled “rolling paper” expresses tacit intention through messages collected from the participants. A group schedule-sharing application shows members’ schedule status from the community server, which encourages participation. Figure 6. 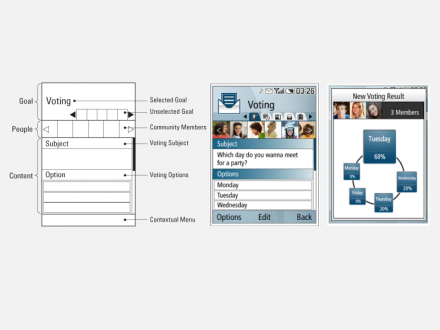 Actual screen shots of the implementation of the UI on a mobile device, which required us to modify the original “wireframe” due to specific requirements of the device; however, the key features are consistent with those described earlier. The infrastructure of a mobile community consists of hardware, software, an interface, and services that knit together everything. People working in the mobile device industry already understand the importance of user interface and interaction for complicated mobile services. We hope our approach contributes to this understanding and suggests ways of adding new and exciting features that encourage end-user adoption, without sacrificing ease-of-use. Ultimately, all characteristics, including environment, people, objects, and processes, should be considered when tailoring a UI to the specific needs of a community. While the communication tools available for communities are often highly attractive, we must keep in mind that the tools should fit the community, not the other way around. As we previously pointed out, mobile devices have been designed primarily for private communication for the past decade. 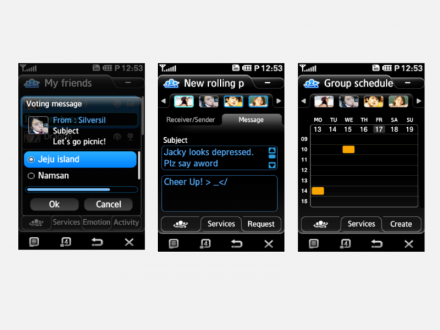 Thus most mobile phone UIs are optimized for private (one-to-one) use. The role of a mobile device as a personal multimedia manager is now expanding into social media and connecting groups of people. These emerging applications ask us to develop features that support rich social communication, both within and across applications. We believe that our novel UI approach is capable of enabling rich interaction for groups of people who are forming and maintaining community. Mobile Devices Should Be About Neither Mobility Nor Devices. Discuss. In the beginning every human-to-human connection was unmediated and local. We lived each day in communities where contact and conversation helped us to share goals and coordinate actions. With today’s complexities, it ain’t that simple. Today technology mediates, enables, and spreads our conversations across divergences of time, space, and experience. Despite touch-based UX and because of cloud-based connectivity, human networks have intricate fractal structures, making our interactions fragmented and fl awed. The complexities of distributed communication mean that we’re as confused as we are elated when we add tweets to SMS or GPS to GSM. Is there any way ahead here? I’ve found that by returning to universals it is possible to see beyond the latest add-on app and to situate collections of features in the unifying context of human need. This is what Youngho Rhee and Juyoun Lee have done by using “sharing, contacting, and collaborating” as the basis for designing wireframes and developing UI features. The result is a clear hypothesis of benefits, and a clear relationship between intent and design. Which raises the question, how far can we go with universals? For example, can universals say more about mobility and community? I believe so. Here’s another universal: Human beings live in a social world, which they co-create in conversation. Enriching our conversations with shared experiences brings us closer together. We naturally want to share our photos and videos and ideas and to meet together. It is in our nature. And when we share experiences, we increase trust, which lowers anxiety and frees up mental and emotional bandwidth to live freer and potentially better lives. So just as “mobility” is a natural state and hence a distinction we can lose, “social networking” is a natural state, to which 50 years of computing is just now catching up. Since all media is social media, I hope we can move beyond the vague and redundant “social” tag and focus on better ways of living together, through shared experience, through better conversations—even those mediated by technology. For example, how can we make these fabulous digital channels carry more than 140 characters of “great burger at shake shack just now”? Where do tweets fit with everything else we have? And what’s missing? In the universals, answers may be found. Mobile devices, check. Social media, check. Next up, shall we have a go at expanding the number of cool apps, or perhaps design for being human? Think about this and then ask what it would mean to carry a thousand friends in your pocket? Dr. Youngho Rhee is a senior UX designer at SAIT (Samsung Advanced Institute of Technology). His main research interests are in the areas of context awareness, agents, and social networking. He has been actively engaged in numerous projects dealing with mobile Internet service design and methodologies for subjective evaluation of mobile applications. He holds a Ph.D. in industrial system engineering from the University of Wisconsin-Madison. He is on the program board for Human Interface and the Management of Information at HCII (Human Computer Interaction Institute). Juyoun Lee is a UX designer at SAIT. Her main research themes are pervasive computing, context awareness, social networking, augmented reality, and interactive media. Recently, she has been working on service design and user behavior studies of mobile Internet services. She has a degree in industrial design and computer science from Korea Advanced Institute of Science and Technology (KAIST). Paul Pangaro is the CTO at Cybernetic Lifestyles in New York City, where he consults at the intersection of product strategy, marketing, and organizational dynamics. He is recognized as an authority on search and related conversational impedances in human-machine interaction, and on entailment meshes, a highly rigorous framework for representing knowledge. He was CTO of several startups, including Idealab’s Snap.com, and was senior director and distinguished market strategist at Sun Microsystems. Paul has taught at Stanford University. [Beta] How do you design? Can Fine Typography Exist in the ’90s? What can Steve Jobs and Jonathan Ive teach us about designing? The Language/Action Model of Conversation: Can conversation perform acts of design? What is conversation? How can we design for effective conversation? What is Interaction? Are There Different Types?